Non-italicized font represents additional information included to support the teacher’s understanding of the content being introduced within the CELL. Italicized font represents information to be shared orally or physically completed with the students at this time. Remind students that everything in the environment, whether naturally occurring or man-made, is composed of chemicals, and research of chemicals has led to the discovery and development of new and improved paints, medicines, cosmetics, electronic components, and thousands of other products. Explain to students that forensic chemists analyze evidence from crime scenes. After identifying and characterizing things like paint chips, blood, glass, and hair (among others), they give expert testimony in court that helps the jury determine a verdict. This page may be downloaded as a PDF (Portable Document Format) and printed as a help during the slide presentation and to make additional notes, by clicking the link below. hover your mouse over the left edge of the presentation to get a view of the thumbnails for all the slides so that you can quickly move anywhere in the presentation. Click on the button below to launch the slide presentation for the CELL. Inform students that during the second Investigation, they will continue to examine common characteristics of simple chemical reactions. 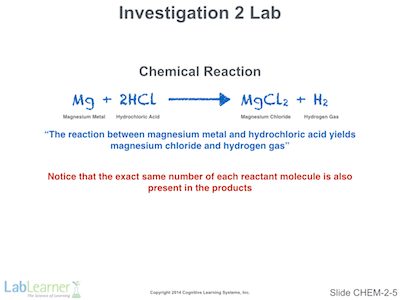 Note: During Lab, students will follow a new chemical reaction between the metal magnesium and hydrochloric acid, this time following the reaction by gas formation. Students will also begin to consider factors that can help chemical reactions along, such as reagent concentration, temperature and stirring. Finally, students will conduct an experiment in which the concentration of one of two reactants is increased and the reaction products are measured. Inform students that this slide uses the reaction from Investigation 1 Lab, the reaction between ammonium hydroxide and hydrochloric acid to yield water and ammonium chloride. 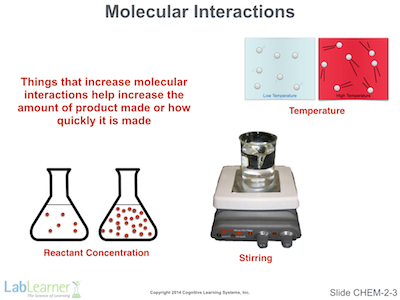 Explain that the upper half of the slide shows molecular models of each reactant and product to illustrate how atoms of the individual reactant molecules must be rearranged to form the product molecules. Read the top half of the slide to students. Explain that in the lower half of the slide shows that the reactant molecules must come into contact with each other in order for the atomic rearrangements to occur. Read the red text at the bottom of the slide. Note: This introduces the concept that certain conditions can help facilitate chemical reactions by increasing the likelihood or rate that reactant molecules interact with each other. This concept is further explored in the next slide. 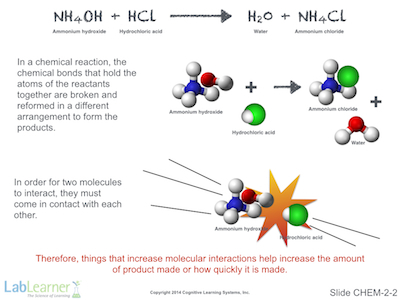 Inform students that this slide illustrates three common ways to promote chemical reactions, all of which do so by increasing the rate at which reactant molecules interact with each other. Explain that increasing the concentration of reactants increases the chances of molecular collisions by simply providing more molecules in the same volume to interact. Ask students to imagine how long it would take one molecule of each reactant to chance upon each other in a beaker or flask – a long time! Explain that both stirring and increasing temperature increase the kinetic energy of the reaction, thus increasing molecular motion and the rate at which reactant molecules collide and interact with each other. Note: This slide focuses on reactant concentration in somewhat more detail. In particular, it considers the reaction that occurs if one reactant is kept constant and the other reactant concentration is increased. Explain that in the example reaction, A and B are hypothetical reactants and C and D are hypothetical products. Explain that the graph shows the formation of product on the y-axis against increasing concentrations of reactant A (the x-axis). 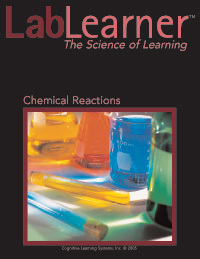 Emphasize that by the third reactant A concentration all of reactant B is likely used up in the reaction process and no more products can be made. This is why the graph flattens out at this time. Explain that if we were able to determine which molecules are found in the reaction at this point, we would find the products C and D as well as unreacted reactant A. Reactant B, on the other hand, would be absent from the reaction. 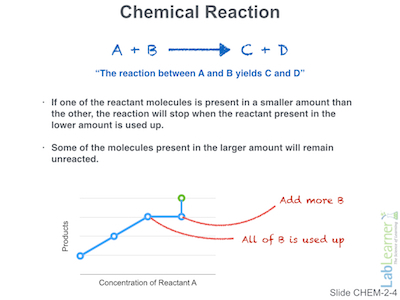 Tell students that adding additional reactant B at this point results in an upward deflection of the graph because unreacted reactant A can now react with the added reactant B to form additional product. This increase in product would continue until one or both of the reactants is used up. Note: The concepts presented on this slide may appear somewhat abstract. However, Trial 6 of the Lab for this Investigation directly demonstrates this phenomenon. It may therefor be beneficial to return to this slide in PostLab when discussing experimental results. Inform students that this slide simply introduces the chemical reaction that will be studied in the Lab in Investigation 2. Remind students that a chemical equation can be read as a sentence. Read the blue text on the slide. Remind students that the exact same number of each atom is present on both sides of the chemical equation. Explain that matter is neither created nor destroyed in this or any other chemical reaction. 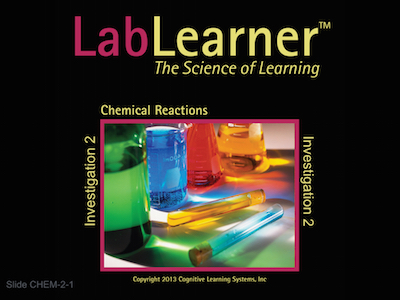 Explain to students that in lab, they will follow the reaction by observing hydrogen gas (H2) formation. Explain to students that they will use a rather crude but rapid method to measure the relative amount of gas production. A balloon is fitted over the reaction flask and traps the escape of H2 gas. In the process, the balloon inflates to varying degrees in relation to the amount of the product is formed. The actual amount of gas formed is then estimated by determining the diameter of the balloon after the various Trials. 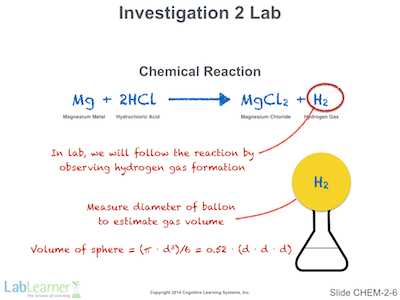 Explain to students that they will use the simple formula at the bottom of the slide to convert the measured balloon diameter to the volume of the hydrogen gas. Note: As the balloon does not form a perfect sphere, application of the diameter into the volume equation is certainly a source of experimental error but may be expected to be an error of similar magnitude for each Trial. 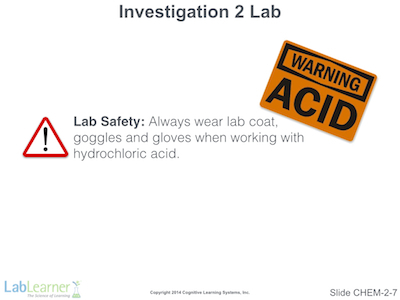 Emphasize to students that caution must be taken when working with caustic chemicals such as hydrochloric acid. Remind students that they must wear lab coats, goggles and gloves throughout this Investigation.